A European spacecraft orbiting Mars is set to make its closest flyby yet of the largest Martian moon, Phobos, on Sunday (Dec. 29). Passing just 28 miles (45 kilometers) above the surface of Phobos, the European Space Agency's Mars Express spacecraft will be traveling too close and too fast to take any images of the lumpy, potato-shaped moon. But the probe's flyby will help scientists understand its weak gravitational field, ESA officials say. Nonetheless, Phobos' gravitational pull will tug Mars Express slightly off course during Sunday's flyby. Ground stations around the world will track the precise location of the spacecraft for 35 hours around its big moment, looking for small deviations in the orbiter's path. These slight movements can then be translated into measurements of the mass and density structure inside the moon. New data could build on past observations from the European orbiter that indicated the Martian moon could be quite hollow inside (between a quarter and a third empty space). "By making close flybys of Phobos with Mars Express in this way, we can help to put constraints on the origin of these mysterious moons," Olivier Witasse, ESA's Mars Express project scientist said in a statement. New measurements of Phobos could help scientists understand the moon's origins. 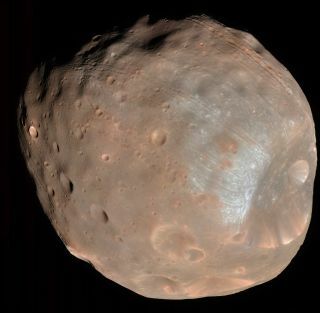 Leading theories suggest Phobos and the only other Martian moon Deimos are either asteroids pulled into orbit around Mars or the products of catastrophic asteroid or comet impacts in Mars' ancient past. Mars Express will also measure of how the solar wind influences the moon's surface, ESA officials say. Michel Denis, the operations manager for Mars Express, said the spacecraft will be passing "almost within touching distance of Phobos." "We've been carrying out maneuvers every few months to put the spacecraft on track and, together with the ground stations that will be monitoring it on its close approach, we are ready to make some extremely accurate measurements at Phobos," Denis said in a statement. Mars Express, the first vehicle built by the European Space Agency to explore another planet, entered orbit around Mars in December 2003. Witasse said the close flyby of Phobos was "certainly an exciting way to celebrate" the 10-year anniversary.